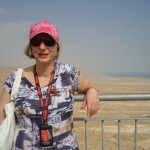 In October 2013 Ann went on a pilgrimage with her sister and the Diocese of Leicester to Israel. 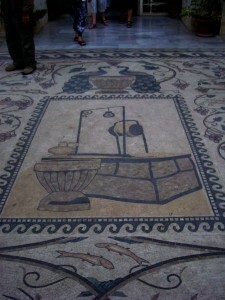 The trip was split between Jerusalem and the shores of the Sea of Galilee. The pilgrimage visited all the main Christian sites including Bethlehem, Nazareth and the Church of the Holy Sepulchre. They walked the Via Delarosa (the Stations of the Cross) as dawn broke across the old city of Jerusalem, watched the sun set over the Sea of Galilee; baked in the desert ruins of Masada and floated in the Dead Sea. It was a very emotional experience for her, visiting places that resonate with the peace of Jesus’ presence contrasting with the stark reality of how Jews were treated in Nazi Germany during WWII when they visited the holocaust museum at Yad Vashem followed by seeing 8m high wall that Israel have built to separate the West Bank from the rest of Israel. They learnt how that wall prevents Palestinian families from farming on land that they own, how it prevents easy movement between the territories in the search for work or education. 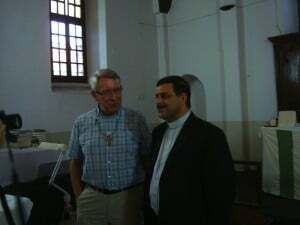 The Rt Revd Tim Stevens, Bishop of Leicester, with Father Ibrahim at St Philip Church, Nablus. Following on from this, for Lent this year, instead of the traditional giving up of chocolate, cake and all things nice she is doing an exercise she is calling ‘Walking for Nablus‘. This is as a direct result of things she saw and learned during the trip. Throughout the pilgrimage they were constantly reminded about how valuable a resource fresh water is in Middle East with the River Jordan being the main source. During a visit to St. Philips Church in the West Bank town of Nablus they learnt how Israel uses 90% of all available fresh water in the country and the other 10% which is for the whole of the West Bank is heavily taxed and unreliable. Even towns like Bethlehem have been forced to rely on water being brought in by tankers for weeks on end when the mains water mysteriously stops running. During their time at Nablus they also learned that there is an old sealed well within the confines of St. Philips Church that could be restored to serve the local community. When the Bishop of Leicester launched his annual Lent Appeal and as a direct result of the Diocese visit to Israel he asked his parishioners to raise money to restore the well at St. Philips Church in Nablus. As Ann lives outside the Diocese and isn’t a regular church attendee she chose to create her own event and ask family and friends to support her. Ann generally leads a very sedentary life and isn’t into much exercise beyond housework and the odd bit of gardening, so she decided to Walk for Nablus. To try to raise her step count every day from the average 2-3,000 steps to a minimum of 5,000 steps a day for the duration of Lent. For every day she walks 5,000 steps she puts 50p in a pot, for 7,500 steps it increases to 75p and for 10,000 it’s a £1.00. To help encourage her and to raise more money she has asked family and friends to contribute 25p or 50p to her pot when she reaches 7,500 or 10,000 steps a day. At DBN Web Design we are right behind her and we will be supporting her by sponsoring her, by walking with her and by the creation of a blog where she can keep her supporters informed of her progress and showcase a few of her photos from Israel.